For other people named David Byrne, see David Byrne (disambiguation). "Todo Mundo" redirects here. For the band, see Todo Mundo (band). David Byrne (/bɜːrn/; born 14 May 1952) is a Scottish-American singer, songwriter, musician, record producer, artist, actor, writer and filmmaker who was a founding member, principal songwriter and lead singer and guitarist of the American new wave band Talking Heads (1975–1991). 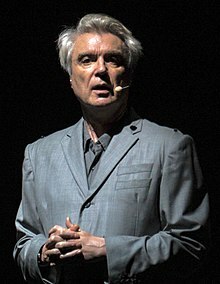 David Byrne was born on 14 May 1952 in Dumbarton, West Dunbartonshire, Scotland, the elder of two children born to parents Tom (from Lambhill, Glasgow) and Emma. Two years after his birth, his parents moved to Canada, settling in Hamilton, Ontario. They then moved to the United States, making their home in Arbutus, Maryland, when Byrne was eight or nine years old. His father worked as an electronics engineer at Westinghouse Electric Corporation. His mother later became a teacher. The family had left Scotland in part because work for his father's engineering skills was in short supply, and in part because of the tensions in the wider family caused by his parents' "mixed marriage", his father being Catholic and his mother being Presbyterian. Byrne recounted these events when he appeared on Desert Island Discs on BBC Radio 4 on 18 March 2018. Before high school, Byrne already knew how to play the guitar, accordion, and violin. He was rejected from his middle school's choir because they claimed he was "off-key and too withdrawn". From a young age, he had a strong interest in music. His parents say that he would constantly play his phonograph from age three, and he learned how to play the harmonica at age five. In his journals, he says, "I was a peculiar young man—borderline Asperger's, I would guess." His father used his electrical engineering skills to modify a reel-to-reel tape recorder so that Byrne could make multi-track recordings. Byrne graduated from Lansdowne High School in southwest Baltimore County. He started his musical career in a high school band called Revelation, then between 1971 and 1972, he was one half of a duo named Bizadi with Marc Kehoe. Their repertoire consisted mostly of songs such as "April Showers", "96 Tears", "Dancing on the Ceiling" and Frank Sinatra songs. Byrne attended the Rhode Island School of Design (during the 1970–71 term) and the Maryland Institute College of Art (during the 1971–72 term) before dropping out. He returned to Providence in 1973 and formed a band called the Artistics with fellow RISD student Chris Frantz. The band dissolved in 1974. Byrne moved to New York City in May that year and was joined by Frantz and his girlfriend Tina Weymouth in September. Unable to find a bass player in New York, Frantz and Byrne persuaded Weymouth to learn to play the bass guitar. Byrne gave her lessons. While working day jobs in late 1974, they were contemplating a band. By January 1975, they were practicing and playing together, while still working normal day jobs. They founded the band Talking Heads and had their first gig in June. Byrne quit his day job in May 1976 and the three-piece band signed to Sire Records in November. Multi-instrumentalist Jerry Harrison joined the band in 1977. The band released eight studio albums before going into hiatus in 1988. Byrne desired to go solo, but it took three years until 1991 to announce that the band was breaking up. A brief reunion for a single "Sax and Violins" in 1991 occurred before dissolving again. The band was inducted into the Rock and Roll Hall of Fame in 2002, when they reunited to play four tracks, including "Psycho Killer" and "Burning Down the House". During his time in the band, Byrne took on outside projects, collaborating with Brian Eno during 1979 and 1981 on the album My Life in the Bush of Ghosts, which attracted considerable critical acclaim due to its early use of analogue sampling and found sounds. 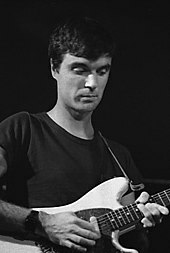 Following this record, Byrne focused his attention on Talking Heads. My Life in the Bush of Ghosts was re-released for its 25th anniversary in early 2006, with new bonus tracks. In keeping with the spirit of the original album, stems for two of the songs' component tracks were released under Creative Commons licenses and a remix contest site was launched. Rei Momo (1989) was the first solo album by Byrne after leaving Talking Heads, and features mainly Afro-Cuban, Afro-Hispanic, and Brazilian song styles including popular dances including merengue, son cubano, samba, mambo, cumbia, cha-cha-chá, bomba and charanga. His third solo album, Uh-Oh (1992), featured a brass section and was driven by catchy tracks such as "Girls on My Mind" and "The Cowboy Mambo (Hey Lookit Me Now)". 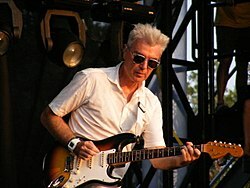 His fourth solo album, titled David Byrne (1994), was a more proper rock record, with Byrne playing most of the instruments on it, leaving percussion for session musicians. "Angels" and "Back in the Box" were the two main singles released from the album. The first one entered the US Modern Rock Tracks chart, reaching No. 24. For his fifth studio effort the emotional Feelings (1997), Byrne employed a brass orchestra called Black Cat Orchestra. His sixth Look into the Eyeball (2001) continued the same musical exploration of Feelings, but was compiled of more upbeat tracks, like those found on Uh-Oh. Grown Backwards (2004), released by Nonesuch Records, used orchestral string arrangements, and includes two operatic arias as well as a rework of X-Press 2 collaboration "Lazy". He also launched a North American and Australian tour with the Tosca Strings. This tour ended with Los Angeles, San Diego and New York shows in August 2005. He has also collaborated with Selena for her 1995 album Dreaming of You with "God's Child (Baila Conmigo)" in 1995. Byrne and Eno reunited for his eighth album Everything That Happens Will Happen Today (2008). He assembled a band to tour worldwide for the album for a six-month period from late 2008 through early 2009 on the Songs of David Byrne and Brian Eno Tour. In 2012 he released a collaborative album with American singer songwriter St. Vincent called Love This Giant. In January 2018, Byrne announced his first solo album in 14 years. American Utopia was released in March through Todo Mundo and Nonesuch Records. He also released the album's first single, "Everybody's Coming to My House", which he co-wrote with Eno. 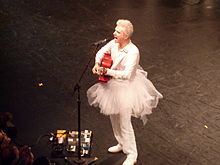 The subsequent tour – which showcased songs from American Utopia alongside highlights from his Talking Heads and solo career to date – was described by NME as being perhaps "the most ambitious and impressive live show of all time", blurring the lines "between gig and theatre, poetry and dance". In 1981, Byrne partnered with choreographer Twyla Tharp, scoring music he wrote that appeared on his album The Catherine Wheel for a ballet with the same name, prominently featuring unusual rhythms and lyrics. Productions of The Catherine Wheel appeared on Broadway that same year. In Spite of Wishing and Wanting is a soundscape David Byrne produced for the Belgian choreographer Wim Vandekeybus's dance company Ultima Vez. Byrne wrote, directed, and starred in True Stories, a musical collage of discordant Americana released in 1986, as well as producing most of the film's music. Byrne also directed the documentary Île Aiye and the concert film of his 1992 Latin-tinged tour titled Between the Teeth. He was chiefly responsible for the stage design and choreography of Stop Making Sense in 1984. Byrne was impressed by the experimental theatre that he saw in New York City in the 1970s. He collaborated with several of its best-known representatives. He worked with Robert Wilson on "The Knee Plays" and "The Forest", and invited Spalding Gray (of The Wooster Group) to act in True Stories, while Meredith Monk provided a small part of that film's soundtrack. Byrne provided a soundtrack for JoAnne Akalaitis' film "Dead End Kids", made after a Mabou Mines theatre production. Byrne's artistic outlook has a great deal in common with the work of these artists. His work has been extensively used in film soundtracks, most notably in collaboration with Ryuichi Sakamoto and Cong Su on Bernardo Bertolucci's The Last Emperor, which won an Academy Award for Best Original Score. In 2004, Lead Us Not into Temptation (music from the film "Young Adam") included tracks and musical experiments from his score to Young Adam. Byrne added "Loco de Amor" with Celia Cruz to Jonathan Demme's 1986 film Something Wild. Byrne wrote the Dirty Dozen Brass Band-inspired score for Robert Wilson's Opera The Knee Plays from The Civil Wars: A Tree Is Best Measured When It Is Down. Some of the music from Byrne's orchestral album The Forest was originally used in a Wilson-directed theatre piece with the same name. The Forest premiered at the Theater der Freien Volksbühne, Berlin in 1988. It received its New York premiere in December 1988 at the Brooklyn Academy of Music (BAM). The Forestry Maxi-single contained dance and industrial remixes of pieces from The Forest by Jack Dangers, Rudy Tambala, and Anthony Capel. In late 2005, Byrne and Fatboy Slim began work on Here Lies Love, a disco opera or song cycle about the life of Imelda Marcos, the controversial former First Lady of the Philippines. Some music from this piece was debuted at Adelaide Festival of Arts in Australia in February 2006 and the following year at Carnegie Hall on 3 February 2007. In 2008, Byrne released Big Love: Hymnal – his soundtrack to season two of Big Love. These two albums constituted the first releases on his personal independent record label Todo Mundo. In 2015, Byrne organized Contemporary Color, two arena concerts in Brooklyn (NYC) and in Toronto, for which he brought in ten musical acts who teamed up with ten color guard groups. The concerts were made into a 2016 documentary film, directed by Bill and Turner Ross, and produced by Byrne. Byrne has contributed songs to five AIDS benefit compilation albums produced by the Red Hot Organization: Red Hot + Blue: A Tribute to Cole Porter, Red Hot + Rio, Silencio=Muerte: Red Hot + Latin, Onda Sonora: Red Hot + Lisbon, and Offbeat: A Red Hot Soundtrip. Byrne appeared as a guest vocalist/guitarist for 10,000 Maniacs during their MTV Unplugged concert, though the songs in which he is featured were cut from their following album. One of them, "Let the Mystery Be", appeared as the fourth track on 10,000 Maniacs' CD single "Few and Far Between". In 1992, he performed with Richard Thompson. Their joint acoustic concert at St. Ann & The Holy Trinity in Brooklyn Heights, New York on 24 March, produced the album An Acoustic Evening which was released the same year. Byrne worked with Latin superstar Selena in March 1995; writing, producing and singing a bilingual duet titled "God's Child (Baila Conmigo)." This became the last song Selena recorded before she was murdered on 31 March. It was included on the singer's posthumous album Dreaming of You. In 1997, Byrne was the host of Sessions at West 54th during its second of three seasons and collaborated with members of Devo and Morcheeba to record the album Feelings. In 2001, a version of Byrne's single "Like Humans Do", edited to remove its drug reference, was selected by Microsoft as the sample music for Windows XP to demonstrate Windows Media Player. In 2002, he co-wrote and provided vocals for a track, "Lazy" by X-Press 2, which reached No. 2 in the United Kingdom and number-one on the US Dance Charts. Byrne said in an interview on BBC Four Sessions coverage of his Union Chapel performance that "Lazy" was number-one in Syria. The track later featured with orchestral arrangements on his Grown Backwards (2004) album. He is featured on the tracks "Money" and "The People Tree", on N.A.S.A. 's 2009 album The Spirit of Apollo. Also in 2009, Byrne appeared on HIV/AIDS charity album Dark Was the Night for Red Hot Organization. He collaborated with Dirty Projectors on the song "Knotty Pine". In the same year, Byrne performed at the Bonnaroo Music Festival in Manchester, Tennessee. He also was a signator of a letter protesting the decision of the Toronto International Film Festival to choose Tel Aviv as the subject of its inaugural City-to-City Spotlight strand. In 2007, Byrne provided a cover of the Fiery Furnaces' song "Ex-Guru" for a compilation to celebrate the 15th anniversary of the founding of Thrill Jockey, a Chicago-based record label. In 2008, Byrne collaborated with the Brighton Port Authority, composing the music and singing the lyrics for "Toe Jam". Jherek Bischoff's 2012 album Composed features Byrne on the track "Eyes". In March 2013, he debuted a fully staged production of his 2010 concept album Here Lies Love at New York's Public Theater, directed by Tony Award-nominee Alex Timbers following its premiere at MoCA earlier in the year. In May 2014, Byrne announced his involvement with Anna Calvi's EP, Strange Weather, collaborating with her on two songs: a cover of Keren Ann's "Strange Weather" and Connan Mockasin's "I'm the Man, That Will Find You". In August 2016, Byrne was featured on "Snoopies" on the Kickstarter-funded album, and the Anonymous Nobody... by De La Soul. Byrne founded the world music record label Luaka Bop in 1990. It was originally created to release Latin American compilations, but it has grown to include music from Cuba, Africa, the Far East and beyond, releasing the work of artists such as Cornershop, Os Mutantes, Los De Abajo, Jim White, Zap Mama, Tom Zé, Los Amigos Invisibles and King Changó. In 2003, Byrne guest starred as himself on a season 14 episode of The Simpsons. In 2005, Byrne initiated his own internet radio station, Radio David Byrne. Each month, Byrne posts a playlist of music he likes, linked by themes or genres. Byrne's playlists have included African popular music, country music classics, vox humana, classical opera and film scores from Italian movies. In 2006, Byrne released Arboretum, a sketchbook facsimile of his Tree Drawings, published by McSweeney's. Byrne is a visual artist whose work has been shown in contemporary art galleries and museums around since the 1990s. Represented by the Pace/MacGill Gallery in New York. In 2010 his original artwork was in the exhibition The Record: Contemporary Art and Vinyl at the Nasher Museum of Art at Duke University. David Byrne has also been a speaker at the TED Talks conferences. In June 2010, he spoke at the TED conference about the effects of architecture on music. Later in October 2010, he performed a hit from his 1988 album Naked titled "(Nothing But) Flowers" along with Thomas Dolby and string quartet Ethel-the TED2010 house band. Byrne had a brief affair with Toni Basil in 1981, and he dated Twyla Tharp between 1981 and 1982. While visiting Japan in 1982, Byrne met costume designer Adelle Lutz, and they married in 1987. They have a daughter, Malu Abeni Valentine Byrne, born in 1989. Byrne and Lutz divorced in 2004. After his divorce, he became romantically involved with art curator and Gagosian Gallery sales director Louise Neri. He also had a relationship with the artist Cindy Sherman from 2007 to 2011. Although a resident of the United States since childhood, Byrne was a British citizen until 2012, when he became a dual citizen of the United Kingdom and the United States. He lives in New York City. His father, Thomas, died in October 2013. His mother, Emma, died on 25 June 2014. Byrne is known for his activism in support of increased cycling and for having used a bike as his main means of transport throughout his life, especially cycling around New York. In Los Angeles, Byrne drives a Citroën DS, but in New York, he does not drive a car. Byrne says that he began cycling while he was in high school and returned to it as an adult in the late 1970s. He likes the freedom and exhilaration cycling gives him. He has written widely on cycling, including a 2009 book, Bicycle Diaries. In August 2009, Byrne auctioned his Montague folding bike to raise money for the London Cycling Campaign. In 2008, Byrne designed a series of bicycle parking racks in the form of image outlines corresponding to the areas in which they were located, such as a dollar sign for Wall Street and an electric guitar in Williamsburg, Brooklyn. Byrne worked with a manufacturer that constructed the racks in exchange for the right to sell them later as art. The racks remained on the streets for about a year. ^ "Talking Heads". Rock & Roll Hall of Fame. Retrieved 16 April 2018. ^ a b "BBC Radio 4 - Desert Island Discs, David Byrne". BBC. Retrieved 23 November 2018. ^ ""Rock's Renaissance Man." TIME Magazine. October 27, 1986". Archived from the original on 15 January 2008. Retrieved 5 September 2017. CS1 maint: BOT: original-url status unknown (link). Retrieved 11 January 2010. ^ Indie Rock's Patron Saint Inspires a New Flock – Referencing Bryne's 15 April 2006 journal entry. New York Times, By Will Hermes, 14 January 2007. Retrieved 11 January 2010. ^ "David Byrne Journal: 4.15.06: Military revolt, back pages". Archived from the original on 14 October 2007. Retrieved 10 November 2006. CS1 maint: BOT: original-url status unknown (link). Retrieved 11 January 2010. ^ Gittins, Ian, Talking Heads: Once in a Lifetime : the Stories Behind Every Song, Hal Leonard Corporation, 2004, p. 140 ISBN 0-634-08033-4, ISBN 978-0-634-08033-3. ^ Isola, Gregory (March 1997). "Tina Talks Heads, Tom Toms, and How to Succeed at Bass Without Really Trying". Bass Player. Archived from the original on 10 February 2009. Retrieved 15 May 2013. ^ "2002 Induction Ceremony". The Rock and Roll Hall of Fame and Museum. Retrieved 15 May 2013. ^ "God's Child (Baila Conmigo)". Discogs. Retrieved 22 January 2019. ^ "Tour Dates for David Byrne – Songs of David Byrne and Brian Eno". David Byrne. 4 August 2008. Archived from the original on 22 August 2008. Retrieved 11 January 2010. ^ "DavidByrne.com - Tours". web.archive.org. 16 March 2009. ^ "David Byrne's New Album, American Utopia, Due March 9 on Todomundo / Nonesuch Records". Nonesuch Records. 8 January 2018. ^ "David Byrne's American Utopia tour might be the most ambitious and impressive live show of all time". NME. 15 June 2018. ^ Steenstra, Sytze (2010). Song and Circumstance. New York and London: Continuum Books. pp. 93–137. ISBN 978-08264-4168-3. ^ Legel, Laremy (23 September 2010). "Review: Wall Street: Money Never Sleeps". Film.com. Archived from the original on 26 July 2013. ^ "About". Contemporary Color. Retrieved 2 September 2018. ^ "Richard Thompson & David Byrne - 24 March 1992: New York". Archive.today. 19 April 2015. Archived from the original on 19 April 2015. Retrieved 23 November 2018. ^ David Byrne to Provide Promotional Music for Windows XP: "Like Humans Do" to Give Music Fans a Taste of the Digital Music Experience in Windows XP Archived 12 February 2007 at the Wayback Machine. Retrieved 11 January 2010. ^ You May Find Yourself On Windows XP – Forbes.com by Davide Dukcevich, 21 August 2001. Retrieved 11 January 2010. ^ Toronto film festival hit by protest over Tel Aviv strand by Ben Walters, 7 September 2009. Retrieved 11 January 2010. ^ Thill, Scott (12 May 2008). "David Byrne Converts Building into Giant Instrument". Wired.com. Advance Publications. Archived from the original on 19 May 2008. Retrieved 11 January 2010. ^ Kennedy, Randy (30 May 2008). "David Byrne's New Band, With Architectural Solos". The New York Times. Retrieved 30 May 2008. ^ "David Byrne Playing the Building". 8 October 2005. Retrieved 11 January 2010. ^ "Brian Baiker. "A Building for a Song." Newsweek. June 2, 2008". Archived from the original on 2 August 2008. Retrieved 1 November 2010. CS1 maint: BOT: original-url status unknown (link). Retrieved 11 January 2010. ^ "David Byrne joins Paul Simon on stage in New York". Archived from the original on 22 June 2008. Retrieved 14 April 2008. CS1 maint: BOT: original-url status unknown (link), NME. Retrieved 11 January 2010. ^ Cragg, Michael (24 May 2011). "Arcade Fire feat David Byrne – Speaking in Tongues". The Guardian. London. ^ "ANNA CALVI ANNOUNCES 'STRANGE WEATHER' EP, LISTEN TO 'PAPI PACIFY' COVER". Domino. 13 May 2014. Retrieved 13 May 2014. ^ Sendra, Tim (August 2016). "And the Anonymous Nobody". AllMusic. Retrieved 23 November 2016. ^ "LUAKA BOP". Luakabop.com. Retrieved 25 January 2017. ^ NPR audio interview 8 July 2000. Npr.org, Retrieved 11 June 2010. ^ "Radio David Byrne". David Byrne.com. Retrieved 11 January 2010. ^ Visual art listing at Bryne's website. Retrieved 11 June 2010. ^ Byrne, David. "David Byrne | Speaker | TED". Retrieved 7 November 2018. ^ Byrne, David. "How architecture helped music evolve". Ted.com. Retrieved 7 November 2018. ^ "TED Talks: 10 Music-Related Lectures That Will Enrich Your Day - NME". NME. 1 September 2014. Retrieved 7 November 2018. ^ a b Bowman, David (2001). This Must Be the Place: The Adventures of Talking Heads in the 20th Century. New York: HarperCollins. p. 202. ISBN 978-0-380-97846-5. ^ Sella, Marshall (29 April 2001). "Same as He Ever Was". The New York Times. Retrieved 15 January 2014. ^ Grant, Richard (16 March 2009). "David Byrne: Stay Hungry". The Daily Telegraph. Retrieved 15 January 2014. ^ Sandall, Robert (28 February 2004). "How the Talking Head Learnt To Sing from the Heart". The Daily Telegraph. Retrieved 15 January 2014. ^ Simon Hattenstone (15 January 2011). "Cindy Sherman interview". The Guardian. London. Retrieved 2 November 2011. ^ Lynskey, Dorian (4 March 2018). "David Byrne: 'I'm able to talk in a social group now – not retreat into a corner'". The Guardian. Retrieved 4 March 2018. ^ "Journal – EMMA BYRNE". Davidbyrne.com. 31 July 2014. Retrieved 25 January 2017. ^ "Bicycle Diaries". davidbyrne.com. Retrieved 20 July 2016. ^ Tom Schnabel (5 November 2011). "David Byrne & Barry White: What Cars They Drove". KCRW Rhythm Planet. Retrieved 20 July 2016. ^ Sutter, John D. (1 April 2010). "David Byrne: Song lyrics are overrated". CNN. Retrieved 15 May 2013. ^ Jonathan Maus (23 July 2009). "Rocker/bike activist David Byrne announces Portland event". BikePortland.org. Retrieved 15 May 2013. ^ Ariel Kaminer. "David Byrne, Cultural Omnivore, Raises Cycling Rack to an Art Form." The New York Times. 8 August 2008. Retrieved 11 January 2010. ^ "Byrne's bibliography on Byrne's Website". Davidbyrne.com. Retrieved 25 June 2010. ^ "David Byrne website film listing". Davidbyrne.com. Retrieved 25 June 2010. David Byrne at AllMusic. Retrieved 8 January 2017.